Angela Levin is an award-winning journalist, a royal biographer, author, broadcaster and public speaker. ANGELA LEVIN has most recently concentrated on writing about senior members of the British royal family. She has previously been a senior feature writer on The Observer, Daily Mail and Mail on Sunday. She has also written for the Telegraph, Newsweek and Standpoint and contributed to NetDoctor, the online medical site. She has been commended twice in the British Press Awards. Angela has written nine non-fiction books. For details see below. 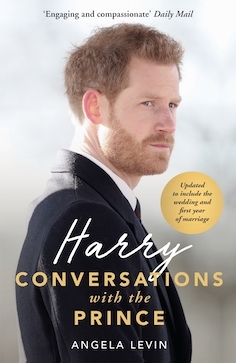 Her latest biography: Harry: Conversations with the Prince was published on May 3 2018. Angela broadcasts world-wide on TV and radio. This includes Sky, BBC4 and 2, CNN, NBC Canadian TV, and many stations in Europe. She is married, has three sons and lives in London. Angela began her journalistic career as a researcher on the Observer Magazine and progressed to write a weekly interview column. She moved to You, the Mail on Sunday magazine, where she continued with a weekly interview slot, talking to a wide range of celebrities, people in the news, the famous and infamous. She also interviewed individuals and families who had experienced great trauma and tragedy. She left to join the Daily Mail as a senior interviewer, where, as well as celebrity interviews, she also wrote an 'agony aunt' column and commented on issues of morality and current affairs. She specialises in interviews, human interest, features and health. In 2015 Angela spent three months preparing a a front page feature for Newsweek magazine on the Duchess of Cornwall. She then spent a year mid 2016 - mid 2017 following Prince Harry which included two wide-ranging exclusive conversations with his royal highness. This too became a cover story. This was followed by an in-depth profile of Prince Charles to mark is 70th birthday on November 14, 2018. This filled most of Event magazine that is published along with the Mail on Sunday. This was both on the cover of the magazine and on the front page of the newspaper itself. ANGELA'S BIOGRAPHY Harry: Conversations with the Prince was published by John Blake/Bonnier in May 2018 and includes exclusive conversations with HRH at Kensington Palace. Angela was also part of the team broadcasting for CNN on May 19th for the wedding of Prince Harry and Meghan Markle. Wormwood Scrubs: The Inside Story, Revealing what really goes on inside England's most famous prison. 2014 Available on Amazon. Max Clifford: Read All About It - Virgin Books - 2005. A biography. Joint creator, writer and editor of the above website, which helps those who have a difficult parent to cope with their situation, feel better and grow stronger. It also assures them that they are not alone and that it is not their fault.